Comments: Jefferson Mills, located on the Hardware River approximately three miles northeast of Scottsville, was built about 1800 and is a brick structure with four floors supported by huge handworked wooden beams. 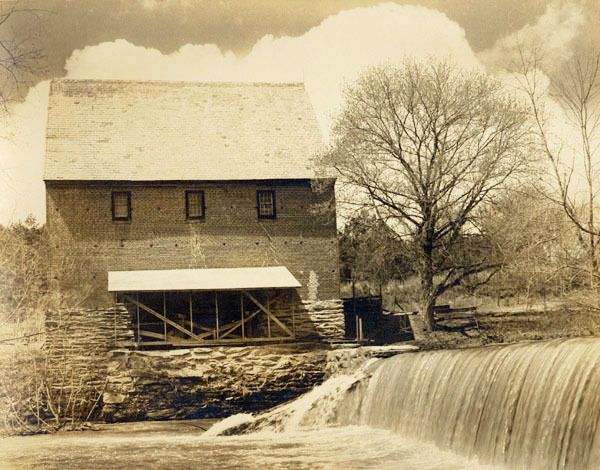 The mill originally was run by an overshot wheel that was fed from a stone dam twenty feet above the riverbed. 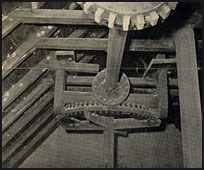 Jefferson Mills' original machinery, shown at right, was handmade of wood and continued to serve the mill reliably right up to its last working day. 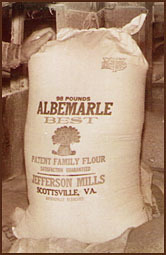 Previously known as Albemarle Mills, the mill was sold to Peter Fields Jefferson on January 28, 1857, and renamed after its new owner. 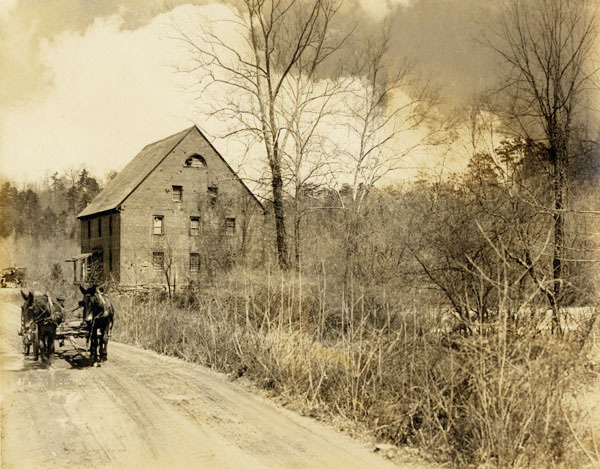 In May 1919, William Thomas Moulton purchased Jefferson Mills and operated it with his son, John Adkins Moulton. 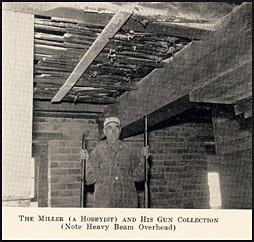 Jefferson Mills was a working mill until 1945 when the last miller, William Williams (shown below left), retired. The Moultons opened a flour, feed, and seed store called 'Jefferson Mills' on Main Street in Scottsville and located in the old Canal turning basin across from today's Scottsville Museum. 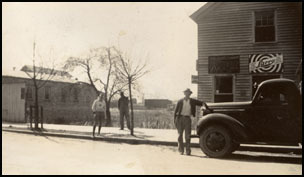 In this 1941 photo at left, John A. Moulton stands beside his delivery truck in front of the store; to his left is the Pitts Chevrolet garage with just the roof of the Canal Warehouse (then known as the Farmer's Exchange) showing behind it. The mill store sold flour, cracked corn, and Larro and Kasco farm feeds. Because this store flooded whenever Mink Creek overflowed, the Moultons later moved it to sites on higher ground. Other Jefferson Mills store locations included the old Braid Factory across from Dr. Stinson's home on Valley Street and on West Main Street where the Post Office is currently located. These photos of Jefferson Mills are part of the Randolph Harris Moulton collection. Ranny resides in Macon, Georgia, and is the grandson of William Thomas Moulton and son of John Adkins Moulton. In 1930, Ranny was born on the floor above the Jefferson Mills store on Main Street.